"Trim the tree with your beloved whilst enjoying this caramel treat." In a 4 quart saucepan, add 1 tablespoon of the oil , and heat over high heat. When oil is hot, add 1/2 cup of popping corn. Keep pan moving constantly. When corn stops popping, remove from heat. Place popped corn in oven to keep warm. Repeat until all corn has been popped. Boil sugar, butter, syrup, and salt for 5 minutes. Remove from heat, add baking soda. Stir well. Pour over popped corn. Spread onto cookie sheets and place in oven for 1 hour. Stir every 15 min. Remove from oven and let cool, breaking apart the popcorn as it cools. Store in air tight containers. 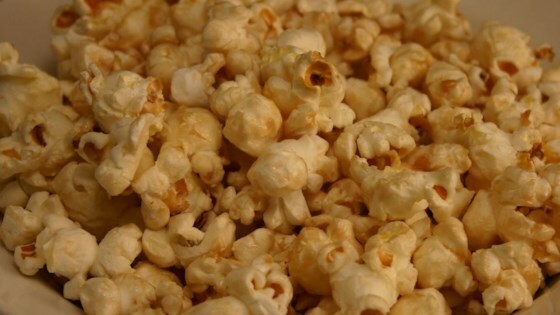 See how to make a top-rated caramel corn recipe.